Lambeth is a borough of inner southwest London. 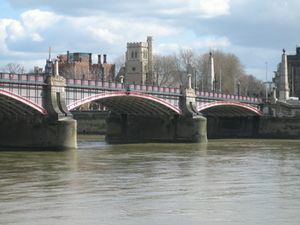 Within the London Borough of Lambeth, there is the South Bank complex (location of the Royal Festival Hall, the National Theatre and the National Film Theatre), London Waterloo station and its surrounds (the Old Vic and Young Vic Theatres and the BFI IMAX Cinema), the official residence of the Archbishop of Canterbury at Lambeth Palace, St. Thomas' Hospital, County Hall and the London Eye. 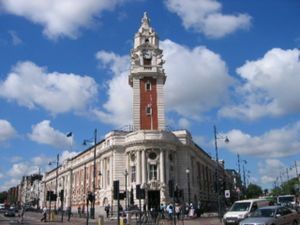 Lambeth includes the districts of Kennington, home of the Imperial War Museum and The Oval Cricket Ground and Brixton. Lambeth was traditionally a largely deprived area of Inner London with very dense housing. However, than began to change in the 1990s as the inevitable gentrification that was so apparent in just about all of inner London also manifested itself here. BRIXTON is a colourful, unique urban area that is like nowhere else in London. Brixton has a mix of residents, ranging from people that have lived in the district for generations to new residents that have moved prompted by a new trendy image that it has gained. It is a multi-ethnic community, with around 24 percent of the population being of African and/or Caribbean descent, giving rise to Brixton being called the unofficial capital of the British African-Caribbean community in London. The diverse population originates from the 1940s and 50s, when Britain invited large numbers from the West Indies to fill the job gaps. There is a thriving scene for clubbing and live music, especially reggae/ska and rock. There are also several trendy markets stretching across the town where you can pick up all manner of exotic foods, textiles and jewellery. It also well known for its nightlife, particularly Brixton Academy and the Fridge along with many other interesting bars, pubs and clubs to explore which easily takes you through to dawn. Electric Avenue (of Eddy Grant song-fame), was the first electric-lit street in the UK, even if it is in a rather obscure location, its worth checking-out for the thriving, competing halal-butchers. Herne Hill is a village-type area on the corner of Brockwell Park, which includes a historic velodrome. Kennington is a residential district with a rich history. The area is characterized by late Georgian and early Victorian roads and squares. It is dominated by two London landmarks: The Oval, an international cricket stadium, and the Imperial War Museum, a national museum. Kennington appeared in the Domesday Book of 1086 as "Chenintune", which may mean "place of the King". Edward III gave the manor of Kennington to his oldest son Edward, "the Black Prince", in 1337, and the prince built a large royal palace between what is now Black Prince Road and Sancroft Street. Geoffrey Chaucer was employed at Kennington as Clerk of Works in 1389. Kennington remains a Royal manor, and the Duchy of Cornwall has a substantial property portfolio within the district. A large number of Members of Parliament have London residences in Kennington; the district falls within the Division Bell Zone, because it is geographically close to the Houses of Parliament. Kennington Park (south London's oldest public park, laid out by Victorian architect James Pennethorne) and St Mark's Churchyard now cover the site of Kennington Common, which was a place for executions, entertainment and demonstrations. In 1746 the Surrey County Gallows at the southern end of the common was used for the execution of nine leaders of the Jacobite rebellion of 1745. The Common was also where the Chartists gathered for their biggest demonstration in 1848. "The Gymnastic Society" met regularly at Kennington Common during the second half of the eighteenth century to play football. The Society - arguably the world's first Football club - consisted of London-based natives of Cumberland and Westmoreland. The tradition of crowds gathering at Kennington Park in advance of marches upon Parliament continues today. Vauxhall, dominated by its gyratory system, is best-known to many Londoners for its gay scene and as a transport interchange (its bus station is the second-busiest in London; there is also a train station served by South West Trains, and the Victoria line stops there) - but it is experiencing rapid gentrification along its Thames frontage. Vauxhall is the location of the offices of MI6 and has been marked out as the site for the new American Embassy. The history of Vauxhall is tied to industry: it was there that Vauxhall Motors was founded, and Royal Doulton had a factory. Before that, however, the Vauxhall Pleasure Gardens, created in 1661, attracted visitors. The largest green space in Vauxhall today is its small Park, which came about in 1890 through the campaigning of Octavia Hill (co-founder of the National Trust) for "More Air for London". In the 1990s, Vauxhall became a prominent feature on London's gay scene; a number of clubs, bars and pubs have placed it as an alternative to Soho. Bonnington Square, close to The Oval, where Vauxhall meets Kennington, developed from a squat, threatened with demolition, into an artists' community, with carefully-tended gardens and community spaces. There are many different types of food available in Lambeth. Brixton, the heart of local government boastes an eclectic mix from all over the world. You will find most of the restaurants in and around Coldharbour Ln and Atlantic Rd. Here are few noted establishments. Clapham High St has a good selection of restaurants as well. South Bank & surrounding areas cater for extremly busy footfalls from the tourists to the office workers that visit the attractions and events along the river. Honest Burgers, does exactly what the name says. Wholesome and hearty (honest)! Bellantoni's - Dario Bellantoni and his staff bring some sunshine to the market with a selection of own-made pasta and an all-Italian wine list. Etta's Seafood Kitchen, exciting, dreamy food but the rushed service when crowded can leave a bad taste in your mouth. El Panzon, Estb.2004 Mexican joint specialising in Tacos, Burritos & Tortas. A pioneering restaurant within its field. It was one of the first to deliver to the table, the Califorian style Burrito to London. It still has the greatest choice of fillings in the UK. Brixton has the advantage that every night you can stay out drinking later than almost anywhere else in London. Even on a Sunday, there are plenty of bars open until 2AM if you really do not want the weekend to end. The more interesting and local bars are dotted down backstreets. Tortue Garden, an avant-garde fetish club in Brixton, that's not for the squeamish! The Renassiance Rooms, famous for its fun roller-disco nights! Th-Sa 21:00-03:00. Fire Club, located in the train arches of Vauxhall, its gay-friendly, but also has Oriental nights, were the East-Asian community show up for a dance, and you can hear Canto or K-Pop tunes. Surprisingly, Brixton has very little in the way of accommodation, and you are more likely to be staying in Victoria (10-15 minutes on tube or train). There are many drug dealers (marijuana, cocaine, ket) who may approach visitors as soon as they get off the tube at Brixton. Buying from them will likely get you arrested, ripped off or scammed. It's highly recommended that you don't deal with these individuals. There are some other Yardi con-man about and pick-pockets too. At night stick to well-lit, busy areas if possible. Brixton is generally quite safe and there should be no worries about travelling short distances to a venue; however, wandering down any poorly lit back-streets is always a risk, as anywhere in London. Loughborough Junction can be an unwelcome place to linger. However, Brixton's reputation somewhat precedes itself, as it has now become a gentrified, tourist district and has long changed since the shady 80's. Nearby Peckham is more dangerous, with many young wannabe gangsters looking for their next jackin' or beef. After dark take care when walking through Clapham Common, there are muggers and a lot of gay men who are out for cottaging or dogging. Night-buses take over for daytime routes after midnight and there are many licenced taxi cab firms that can be used. The use of unlicenced cabs by men who stand near Clapham Junction Station is under no circumstances advised. This page was last edited on 20 March 2018, at 08:53.